Choose a tree that’s native to your area for the fullest growth and smallest environmental impact. Research the types of trees you find attractive to determine which will fit best in your yard and be compatible with your existing foliage. Ask your local nursery for suggestions if you need help choosing. Tree planting is a delicate process. When you get your tree, plant it as soon as possible to keep it healthy and help it start to grow. Your hole should be about three times the size of the roots you’ll be transplanting for the best width, but should not be any deeper than the base of the trunk to give the roots easy access to air and water while they heal and expand. If you’re not completely sure how to plant your tree properly, contact a professional to avoid killing your tree or damaging your yard or home. When you first plant your tree, it will need some attention to make sure it’s growing properly. Water your tree weekly for the first few months of its growth, but be careful not to overwater. This can lead to oxygen deprivation which can sicken or even kill your new tree. Consider adding fertilizer before you plant to boost your tree’s roots, or cover with mulch to aid in water and oxygen access. If you notice anything unusual, contact your nursery or landscaping company to make sure your tree is healthy. A beautiful tree-lined yard doesn’t have to be a difficult task. 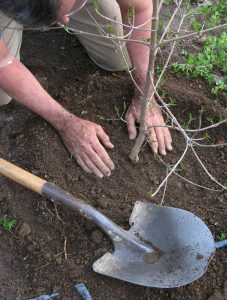 Tree planting is easy when you know what you’re doing, and adds beauty to any yard.